OKLAHOMA CITY -- The "Shammgod." It's the holy grail of crossovers, a move so ruthless and lethal it has its own name. The name comes from God Shammgod, a point guard who played in college at Providence and briefly in the NBA for the Washington Wizards. He didn't invent it, he just popularized it. 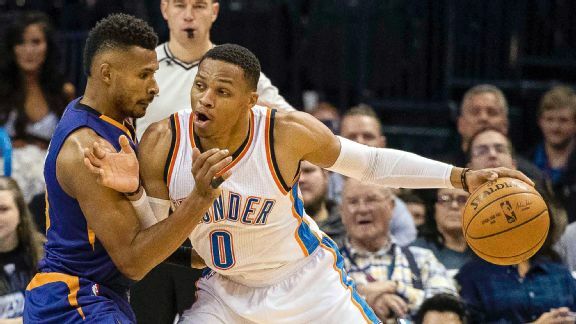 It's a move seen far more on the blacktop than on an NBA floor, but against the Phoenix Suns on Saturday, Russell Westbrook unleashed one into a jumping no-look pass to set up a Steven Adams dunk, capping off a career night of passing in the Oklahoma City Thunder's 114-101 win. "Yeah, I tried it," Westbrook said, laughing. "It worked." It went like this: Westbrook got a ball screen from Andre Roberson, and then attacked Suns guard Tyler Ulis with a full head of steam. Westbrook, who already has one of the best Euro steps in the game, planted as if he was going to drive the left side of the lane, but abruptly changed course with the ball sort of out in limbo. He snatched it back with his right hand, side-stepping Ulis and drawing help from Suns forward Marquese Chriss. From there, it was easy. Just drop it to Adams and let the Thunder big man fire it through the rim. It left social media ablaze and the Thunder's bench buzzing, with Victor Oladipo mimicking the move. "I just try to read and react, man, try different moves," Westbrook said. "Bring some joy to the game, and that's what I try to do every night is have some fun, put smiles on people's faces. That's the best part of this game, [to] be able to touch people in different ways in all parts of the world just by having fun and enjoying the game." The Shammgod assist was Westbrook's final helper of a career-high 22 -- to go along with 26 points and 11 rebounds for another triple-double -- and it wasn't the only one that was flashy and fancy. As good as it was, it wasn't even Thunder forward Jerami Grant's favorite of the night. He liked a lefty no-look fastball to set up Semaj Christon off a baseline cut. Westbrook had another in transition that was a one-motion, no-look bounce pass to set up Roberson, who was fouled. It was that kind of night for Westbrook. Russell Westbrook's career-high 22 assists keyed another triple-double. • What if Shammgod was one with Russ? "It's just cool, it's fun," Roberson said of Westbrook's passing. "When you see that from a player, it makes you want to go out there and just play like he's playing. There's less stress, just playing the game you want to play. What he did with the Shammgod was like going back to the playground. It was pretty dope. The whole bench got hyped and everybody on the court got hyped. It was a good night." Westbrook has a knack for developing a hot passing hand. He'll pile up assists in bunches, and when he pulls off a flashy one, he'll get even bolder and more daring with the next one. "Sometimes I like to try stuff," Westbrook said. "Sometimes it goes well, sometimes it don't. But tonight it went well, and that's just how it goes." Westbrook has never described himself better.